WASHINGTON DC Amendment Act B18-622 "Legalization of Marijuana for Medical Treatment Amendment Act of 2010" - Approved 13-0 by the Council of the District of Columbia on May 4, 2010; was signed by the Mayor on May 21, 2010. After it was signed by the Mayor the law underwent a 30-day Congressional review period. Neither the Senate nor the House acted to stop the law, so it became effective when the review period ended immediately. The legal Medical Marijuana Program in Washington DC allows legal medical marijuana patients to receive a marijuana recommendation from a certified physician, and apply for a State-issued District of Columbia Medical Marijuana ID Card. 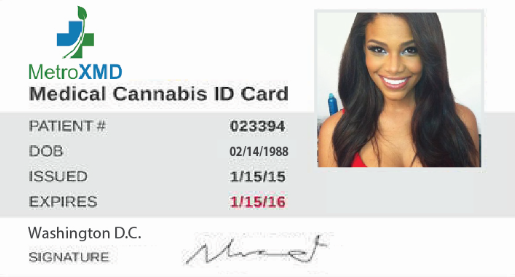 The District of Columbia Marijuana Registry is mandatory, and does NOT accept other state’s registry cards for purchase at in-state dispensaries. Washington DC has received over thousands of recommendations and is continually growing. In order to become a legal medical marijuana patient you must have a qualifying condition as outlined by the department of health services and/or department of justice. The process for getting Medical Marijuana can be done via the following two steps: (1) Obtain a recommendation from a registered physician recommending you for medical marijuana, (2) Submitting your application to the Department of health for your medical marijuana card. Patients may also qualify by undergoing any of the following medical treatments: chemotherapy;radiotherapy; the use of azidothymidine or protease inhibitors; or any other treatment as determined by rulemaking, whose side effects require treatment through the administration of medical marijuana in the same manner as a qualifying medical condition. MetroXMD will assist you with obtaining all of above and completing the whole process from start to finish, making getting your card as easy as can be! Click on “Get Your Card” to get started. If you have questions then please call us, email us, or chat with us now, we are eager to talk!